A team of researchers led by Caltech scientists has shown that nanoparticles can function to target tumors while avoiding adjacent healthy tissue in human cancer patients. "Our work shows that this specificity, as previously demonstrated in preclinical animal studies, can in fact occur in humans," says study leader Mark E. Davis, the Warren and Katharine Schlinger Professor of Chemical Engineering at Caltech. "The ability to target tumors is one of the primary reasons for using nanoparticles as therapeutics to treat solid tumors." The findings, published online the week of March 21 in the journal Proceedings of the National Academy of Sciences, demonstrate that nanoparticle-based therapies can act as a "precision medicine" for targeting tumors while leaving healthy tissue intact. In the study, Davis and his colleagues examined gastric tumors from nine human patients both before and after infusion with a drug—camptothecin—that was chemically bound to nanoparticles about 30 nanometers in size. "Our nanoparticles are so small that if one were to increase the size to that of a soccer ball, the increase in size would be on the same order as going from a soccer ball to the planet Earth," says Davis, who is also a member of the City of Hope Comprehensive Cancer Center in Duarte, California, where the clinical trial was conducted. The team found that 24 to 48 hours after the nanoparticles were administered, they had localized in the tumor tissues and released their drug cargo, and the drug had had the intended biological effects of inhibiting two proteins that are involved in the progression of the cancer. Equally important, both the nanoparticles and the drug were absent from healthy tissue adjacent to the tumors. The nanoparticles are designed to be flexible delivery vehicles. "We can attach different drugs to the nanoparticles, and by changing the chemistry of the bond linking the drug to the nanoparticle, we can alter the release rate of the drug to be faster or slower," says Andrew Clark, a graduate student in Davis's lab and the study's first author. Davis says his team's findings suggest that a phenomenon known as the enhanced permeability and retention (EPR) effect is at work in humans. In the EPR effect, abnormal blood vessels that are "leakier" than normal blood vessels in healthy tissue allow nanoparticles to preferentially concentrate in tumors. Until now, the existence of the EPR effect has been conclusively proven only in animal models of human cancers. "Our results don't prove the EPR effect in humans, but they are completely consistent with it," Davis says. The findings could also help pave the way toward more effective cancer drug cocktails that can be tailored to fight specific cancers and that leave patients with fewer side effects. "Right now, if a doctor wants to use multiple drugs to treat a cancer, they often can't do it because the cumulative toxic effects of the drugs would not be tolerated by the patient," Davis says. "With targeted nanoparticles, you have far fewer side effects, so it is anticipated that a drug combination can be selected based on the biology and medicine rather than the limitations of the drugs." These nanoparticles are currently being tested in a number of phase-II clinical trials. (Information about trials of the nanoparticles, denoted CRLX101, is available at www.clinicaltrials.gov). 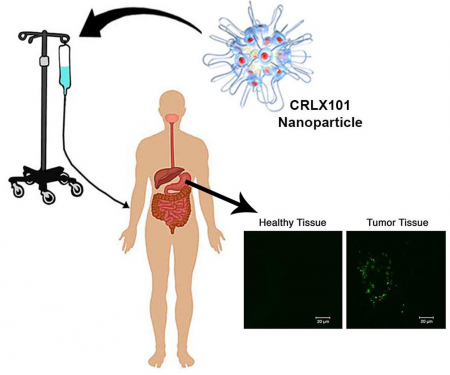 In addition to Davis and Clark, other coauthors on the study, entitled "CRLX101 nanoparticles localize in human tumors and not in adjacent, nonneoplastic tissue after intravenous dosing," include Devin Wiley (MS '11, PhD '13) and Jonathan Zuckerman (PhD '12); Paul Webster of the Oak Crest Institute of Science; Joseph Chao and James Lin at City of Hope; and Yun Yen of Taipei Medical University, who was at City of Hope and a visitor in the Davis lab at the initiation of the clinical trial. The research was supported by grants from the National Cancer Institute and the National Institutes of Health and by Cerulean Pharma Inc. Davis is a consultant to and holds stock in Cerulean Pharma Inc.